I think a bar was liquidating all its possessions and I just happened to stumble upon a lot of these autographed photos. While I rarely purchase these pieces of memorabilia, I can’t pass up a good deal. It took me a long time to track down Tom Brookshier and the internet made it possible even though I owned NFL statistical books. 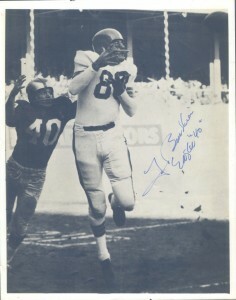 Brookshier would be drafted in the 10th round by the Philadelphia Eagles in 1953. His rookie season was nothing short of dominating. He’d make 8 interceptions that season and a fumble recovery through only 11 games. Due to commitments to the military and the Air Force Academy, Tom would not regularly for another 2 seasons, but would make 4 picks in 1957 and 3 in 1959. Tom would also double as the team’s defensive coordinator upon his return. He’d make the ProBowl in 1959 and 1960, and first team AP in the latter as well where the Eagles would win an NFL Championship that year. His career would end after 7 games in 1961 due to a compound fractured leg against the Bears. Tom would pick up and go straight into broadcasting, paired with great Pat Summerall whom he broadcasted with on Superbowls X, XII and XIV. Of note, Brookshier was Summerall’s original broadcasting partner before John Madden. It’s in broadcasting he’d gain his greater notoriety where he once said the Louisville Cardinals basketball team, “Had a combined IQ of 40,” on air. He’d later get involved in radio where and also was a real estate consultant and his number was retired by the Eagles. Sadly, on January 29th, 2010 he passed away at the age of 78 from cancer.